Highlight was the BRING tour ending there and having an afterparty. Political rep visit from Rep. Nancy Nathanson and Sonya Carlson, EWEB commissioner. 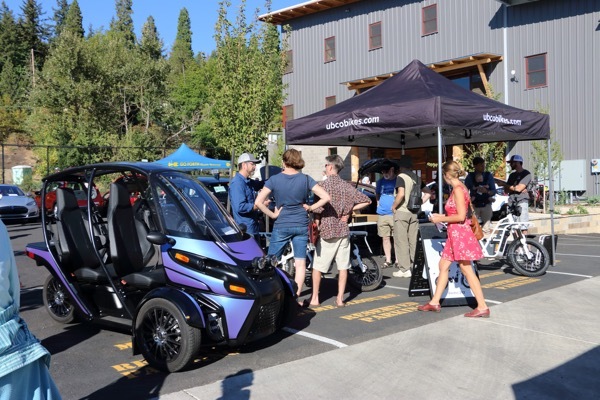 Attendees browsing ARCIMOTO cars and UBCO bikes. The BRING Home and Garden Show's afterparty showcases the latest and greatest electric vehicles on the market! Come test drive new EVs and chat with current owners about their vehicles. This free event is brought to you by BRING Recycling, Forth Mobility, Eugene Water and Electric Board, and Lane Regional Air Protection Agency. Test drives will be available for some vehicles. Others will be private vehicles for show and tell. If you'd like to bring your EV for the demo, please register here ahead of time. Display spots are limited and will fill up quickly! Registered attendees report 550,110 electric miles driven.